HomeOur newsNo KID, no Deal ! 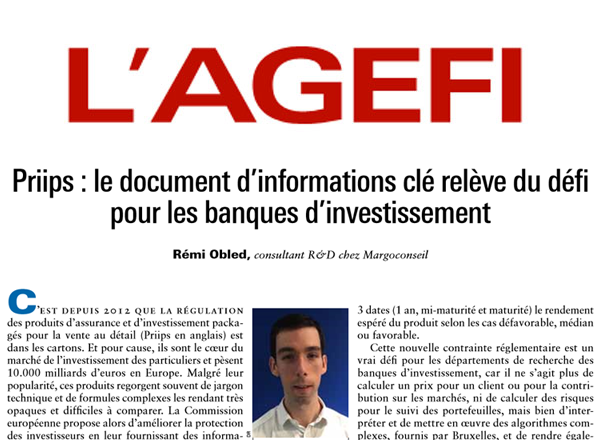 Priips: the key information document is a challenge for Corporate and Investment Banks. The project to regulate packaged retail investment and insurance products (PRIIPs) started in 2012. With good reason: they are at the core of the retail investment market and represent 10 trillion euros in Europe. In spite of their popularity, these products overflow with technical jargon and complex words and as a result, are very opaque and hard to compare. Thus, the European Commission has proposed to improve the protection of investors by providing them with pre-contractual information via the implementation of the Key Information Document. Investors will then be able to compare risk, performance and cost indicators. The initially announced launch date was in December 2014. But finally, the KID was only imposed since 1 January 2018. No KID, no deal. In order to uniformize the different figures given by financial institutions, the Commission provides very precise specifications and algorithms applying to each product category. The method relies on the implementation of adjusted price paths, simulated thanks to random draw among past underlying quotation.The Market Risk Measure is based on the calculation of VaR-equivalent volatility and then, on the association of the corresponding MRM. Scenarios give the expected return of the product depending on unfavourable, median and favourable cases, and this, at three different dates: 1 year, mid-maturity and maturity. This new regulatory constraint is a real challenge for R&D departments in Corporate and Investment Banking. It’ not about calculating a price for a client or for market contribution, or calculating risks for portfolio monitoring anymore, it’s about understanding and implementing complex algorithms, provided by the European Commission, and making these given products as clear as possible for the individual and non-professional investors. This new regulatory constraint is a real challenge for R&D departments in Corporate and Investment Banking. Technical challenges are important too. Imagine how to industrialize the costly calculation of these simulations and how to make sure they converge in a reasonable time by using grid computing. Imagine calculating these indicators on all type of products and all underliers by ensuring the calculation code is as generic as possible and agnostic to the type of product. Imagine calculating these indicators not only for the future manufactured products but also for the ones already available (including those available for many years), by standardizing old bookings. Finally imagine daily calculating all these indicators, for every deal, in order to inform the client of possible changes of MRM, by using the impressive capacity of Cloud calculation. In the end, we can say that with Basle, MiFID, MiFID II, PRIIPS and others, regulatory constraints imposed on banks deeply change the way they are doing business. These regulations also have an impact on their image and modify how they interact with clients. Moreover, they have triggered internal changes. New projects are implemented and new jobs are created, especially in the area of regulatory monitoring, developing new opportunities. The proactive compliance and the participation in task forces even before the definition of the new regulatory measures are for sure an important competitive advantage. Hence, should we just stop talking about regulatory constraints, but about regulatory opportunities instead?